Initially, Rene said that she would use one of her other fancy ball dress for her Senior Ball. I must admit, I was much relieved, as it took the pressure from me to do another fancy dress under a short timeframe. When it turned out that I finished her sister's outfit with plenty of time to spare, Rene reconsidered her position and asked if I *would* make her a new dress. Well, of course. 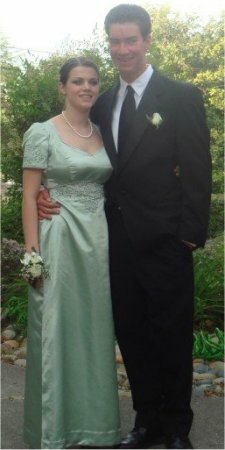 After all, I did have 2 weeks before the dance and Rene had a fairly simple dress in mind. So, we bought the pattern and fabric (4 yards of polyester shantung in a lovely minty green). I made a mock-up of the dress and upon seeing it on her, Rene flatly rejected it. It made her look "too boxy". Even fiddling with seam placement and other adjustments, this pattern was not going to work. But, I told her that if she found another pattern that didn't use any more fabric, I would still be willing to make her a dress. 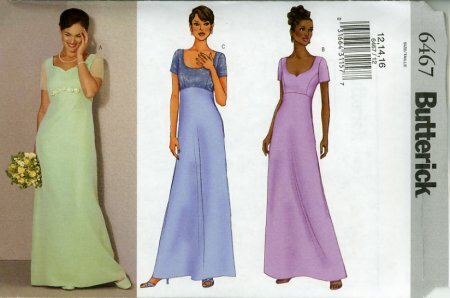 So, another candidate was found (Butterick 6467) .. a very simple design, clean lines ... almost TOO simple. I suggested that we could add some machine embroidery to the sleeves and midriff to make it a bit more fancy ... and Rene agreed, pending what design was used. She wanted an "airy" design and we found one at Secrets of Embroidery/My Fair Lady designs: their Victorian Trellis Bridal 2 collection. For the midriff, I used 1A, 1C and 1D. The only change I made was to separate out the main scroll and change the color to silver (the design calls for the scroll to be the same color as the flower, but Rene wanted a silver scroll). 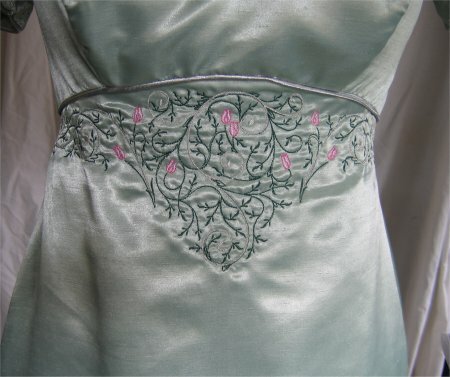 I used Superior Silver Metallic and Coats-Clark Trilobal Polyester for the pinks and green. Once again, a mock-up was made and because Rene has a lovely hour-glass figure, alterations were required to make the bodice fit properly and the skirt fit properly under the bustline. 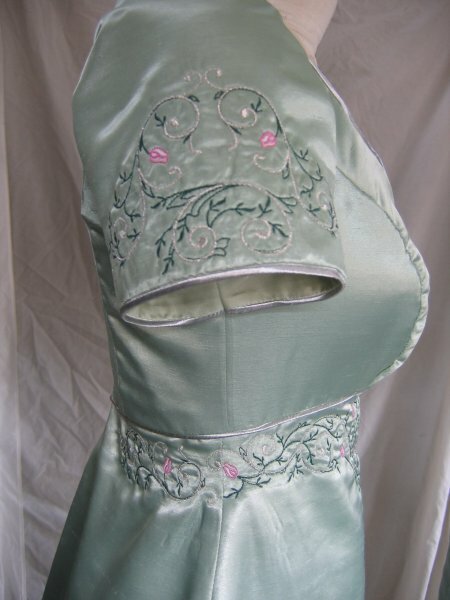 The dress was made up, the sleeves were embroidered and silver piping inserted into the sleeve hem seam, the under bustline seam and the neckline. I was emmensely gratified to discover that the dress fit wonderfully. (I always have my doubts). I was very impressed with this particular pattern, as it called for the dress to be fully lined ... the inside is smooth against the skin and looks beautifully finished. Can you keep a secret? There is a real screw-up with the lining. We had originally planned to put embroidery around the hem of the dress and with that in mind, I sewed the lining into the dress as called for by the pattern. But when I printed out the template for the design, I realized the scale was much too small for the hem. It was much better suited for the midriff area. The problem was that the skirt and lining were already sewn together; I didn't have a flat skirt to embroider. So, I needed to scrunch the lining out of the way and hold the entire dress up so it wouldn't create a drag on the embroidery machine arm. It wasn't until the embroidery was done and I was cutting away the excess stabilizer that I realized that I hadn't moved all the lining free of the embroidery area. AAAAARRRRGGGGHHHHHH! Part of the lining was now firmly and irretrievably embroidered to the skirt. AAAARRRGGGHHHH! To resolve the problem, the only solution was to cut around the lining that was sewn to the skirt. This let the lining hang free as it was supposed to do ... except now it had two HUGE holes in it. I then appliqued extra lining fabric over the holes to make the lining structually sound again. It doesn't look particularly wonderful (the applique was neatly and nicely done ... but you can SEE that they are obviously patches) but I did fix the problem.